Are you in the mood for something stuffed? Do you have a craving for something sweet and flaky? Are you in love with little stuffed-baked-apple-pie also known as empanadas? If you’re nodding yes to all of the above then preheat your oven to 375F and let’s start baking. In a large mixing bowl, stir together flour and salt. Then cut in the butter with a pastry blender until mixture resembles coarse bread crumbs. Then combine the iced water and vinegar and add in to the flour mixture and mix it all together until it forms a ball. Wrap the dough in cling wrap and refrigerate it for 30 minutes or until ready to use. Then roll out the dough on a lightly floured surface. Cut into circles with a cookie cutter or you can use the rim of a drinking glass. Place a small amount of the apple filling in the center of each circle and then moisten the edges with water and then fold it over to form a half circle. Now press the edges together to seal. Brush the top with egg wash and then give it some cinnamon-sugar love to finish. Pop that into the preheated oven and let the love bake for 20 minutes or until golden brown. Mix all of the above ingredients together. These cute little hand pies are definitely one of my go-to on fast and easy desserts. You can also make these ahead of time and freeze it until you want to eat them. 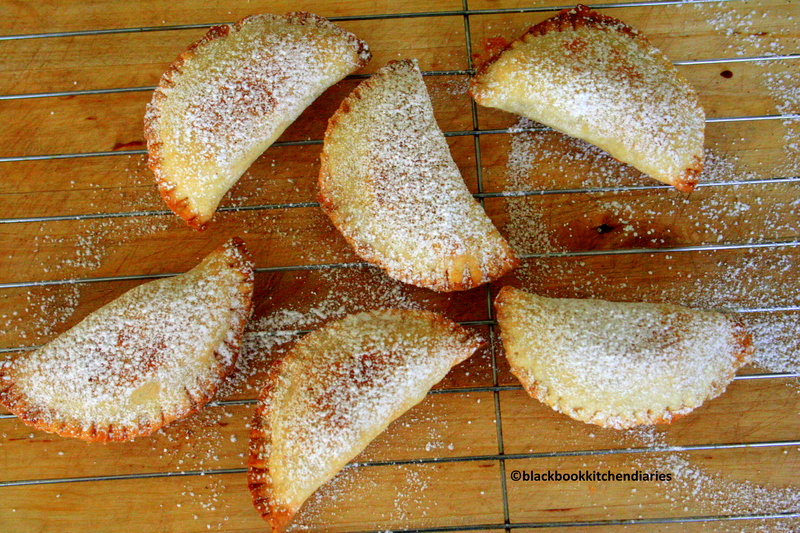 These apple empanadas are a great alternative to the traditional whole apple pie. Plus its less messy when you want to eat them on the go. Of course they are no rules here. You can plate them up really pretty and serve this up with your favorite ice cream or whipped cream for the full effect! Ps: I love this hot with vanilla and caramel ice-cream. So pretty and tempting! 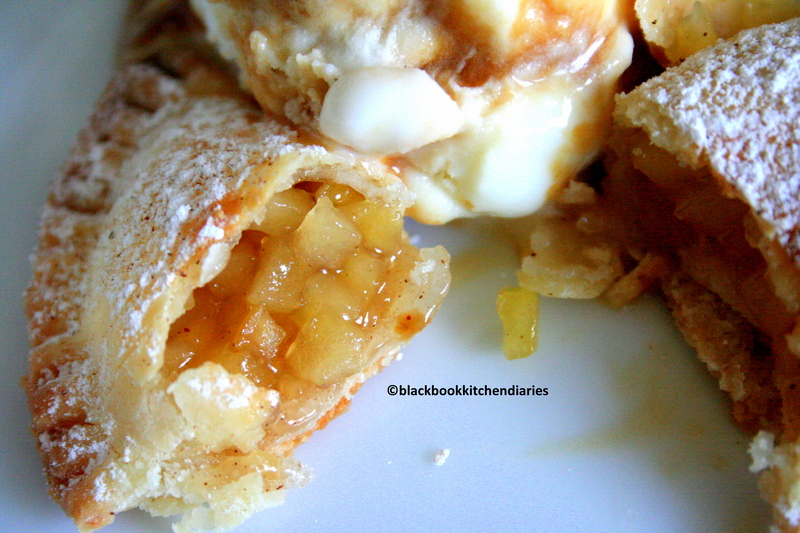 the apple filling looks wonderful and so does the pastry. Psssst, don’t tell anybody. I bought some for my kids today. They were also homemade. Now I have a recipe. Thanks. I like yours better, since they have a lot more filling and the shell is thinner. Yes, yes! Those empanadas look so tasty and tempting! Oh my, I’m craving apples like you can not believe. Actually I should go to bed, because I want to head to the farm stand first thing in the morning for some. I will be dreaming about these I hope you know. Hope you have a great weekend. on September 17, 2011 at 8:58 am | Reply Platanos, Mangoes and Me! I am quite lazy…I found a company that makes the best pastry for empanadas so I concentrate on the filling. Your pastry looks so beutiful and I might get inclined to try it. The filling looks delicious. Beautiful and great presentation. Your pies look fantastic! I love apple empanadas. Your pictures are giving me such a craving now! I am in such a mood for carbs and sweets lately and it’s getting me in trouble 🙂 These look like just the right side for an apple pie craving and they’re adorable! Oh what beautiful little tender empanadas you have made! They look flaky, tender and delicious with the apple filling. Just the right amount of everything. Beautiful photos. Oh these look so fabulous! So cute – like mini apple pasties. I have seen a lot of stuffed apple something on blogs but your is the best looking so far and looks just as good tastes wise. These look fantastic! I love empanadas and I have never made my own. I have a peach crisp cooling on the counter and now I’m craving these instead! Yummy! Never had one before! Your empanadas look so insanely good! I wish I could reach in and grab two – one for each hand! This is my type of sweet goodie! Thank you for sharing this delicious recipe! I adore apples…especially when dough is involved. I’m hungry again (we just finished dinner a couple of hours ago). Yummy..as always. Much love from Austin! oh yes please! Anything that turns apple pie into finger food can only be worshipped! Yes to having those with vanilla and caramel ice cream! Craving some now. These look delsih with their juicy apple filling. They are similar to apple turnovers but with different pastry. I’m always in the mood for something STUFFED! These look amazing! these look AMAZING! i’ve only had savory empanadas before so i love the idea of a sweet version. bookmarking to make! Yes! I am ready for something filled! These look great, I want 3 of them now! So pretty & yum looking !! I love the fact that these are baked and so much more healthy! Perfect comfort food for the coming months. yes and yes and yes, i want some! I’m so making this very soon! Your photo of side shot totally made me crave. I HAVE TO make this!! I actually can’t focus now…too excited. I am not sure if you know, but I don’t make dessert, especially baked goods… so it’s rare I got this much motivation! I’m gong to save this recipe now. Thanks!!!!!!!!! your pastry looks great and your filling looks even better! i love hand pies–any method that gets that goodness into my belly with rapidity and ease is a winner to me! I did nod yes to all of the above! The granny smith apple filling looks delicious. this kind of dough is good for a pastry cream too…or lemon curd! These are so cute and they sound delicious! Do I have a craving for something sweet and flaky? Well, no I didn’t until you mentioned it. Now I do! These look very delicious. I’m intrigued by the vinegar in the pastry. Is it for flavour? crispness? I love empanadas and the apple filling looks delicious! So pretty and cute! Sweet and savory empanadas are popular down here, yet somehow I still haven’t made any. I bet these were delicious! These look great – definitely adding to my must bake list! You had me at apple. What a perfect little sweet treat!! What a perfect treat! Not too much but just right. Something that Goldilocks would love and so do I. I love treats like this that everyone feels free to indulge in because it’s just the right size without lacking flavor! I’ve been craving empanadas lately…thanks for the recipe!! 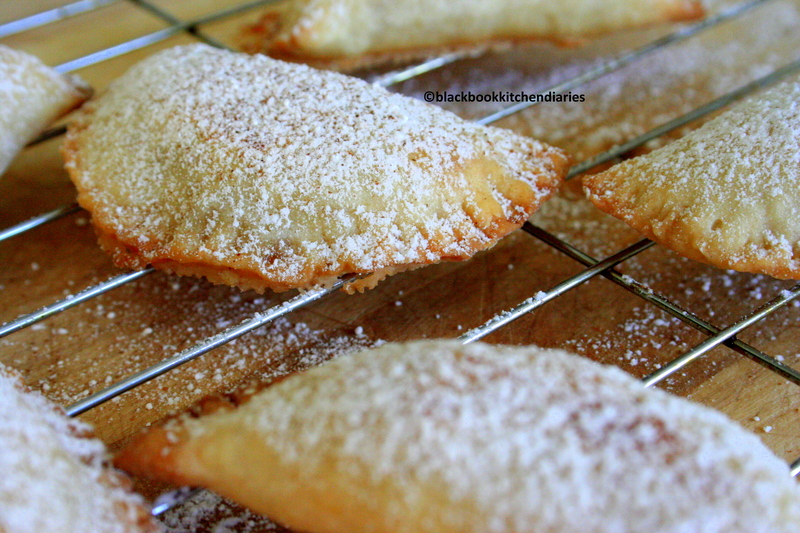 I’ve been craving empanadas lately…the cinnamon and apple variety look delicious! 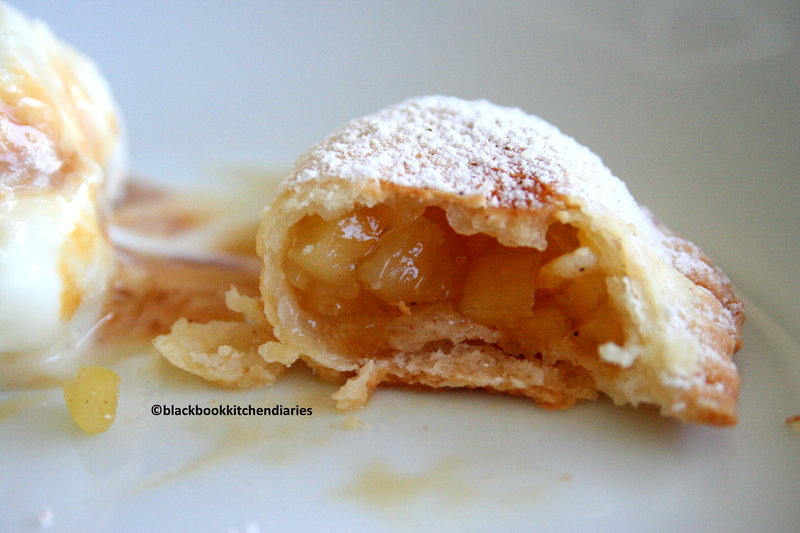 Look at the apple filling oozing out…. You know what these remind me of, little teeny mcdonalds apple pies. I love those things, and I would love these even more, they are just my kind of thing! This looks awesome. I love savory empanadas and I am sure I will love a sweet one too. Oh! These apple empanadas look great…love the idea of little bites. i love apple empanadas. nothing says fall more like apple baked goods 🙂 Thanks for stopping by and sharing your 7 facts. I enjoyed reading them! I usually go or the savory empanadas first, but your sweet apple filling have swayed me majorly to the other side! These look gorgeous! To freeze, do you bake them first? Great picture of the luscious filing inside the flaky pastry. Wish I had one for breakfast. Your apple empanadas look beautiful. Since I have an apple orchard, I am always looking for a new recipe and this looks delicious. These empanadas look adorable and delicious! I love small, individual desserts, and these sound like the perfect fall treat! Oh my gosh, these look just incredibly good! Perfect little apple treats . . . yum!